I posted an Instagram photo the other day of a few of the people that currently inspire me. Well, 4 of them at least. There are so many to mention and could write an essay on them and why they inspire me. At some point I will but for this, I wanted to talk a little on how I get inspired in other ways and what I do with said inspiration. I tend to get inspired in random ways and generally out of the blue. I can just be walking passed something – an arch, building, statue or painting – and just get hit by a wave of inspiration. In my head I will have this whole conversation in that goes along the lines of: “I can change this, that and then do this. Ohh this would be cool, wonder if I could replicated that. What about LEDs. Needs more light. Can I make that? Who do I know who can make that? Who would want to play”. Other times I will see a post from a friend asking ‘What can be done with X’ – instant brain explosion of ideas. Recently I have gotten better in talking with them and making those ideas happen however long it may take to set up. I have sketchbooks full of ideas from moments like that. I will listen to a song and just sketch something out. The ideas range from sets, outfits to ideas for new lighting rigs. The reason I have so many sketchbooks is Guillermo del Toro’s fault. 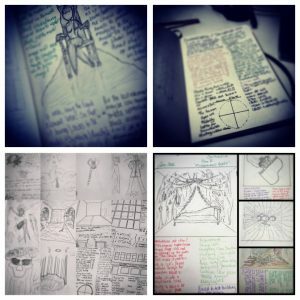 I fell in love with his ‘Cabinet of Curiosities’ book and in turn, that kick-started my own love of having sketchbooks. A current project (build wise) is a couple of latex outfits. Of course, it couldn’t just be latex outfits. That wouldn’t be me. No, they have to include LEDs and electronics to create pulsing lights. Now I have learned how to wire pixel boards, LEDs, program the LED pulses and power it. A couple of nights research and a dozen or so pages of notes & diagrams. All this because of an outfit I saw and thought I could improve on it (electronics wise). One thing I have found invaluable is Pinterest. My Pinterest board is where I collate inspirations and mood boards. 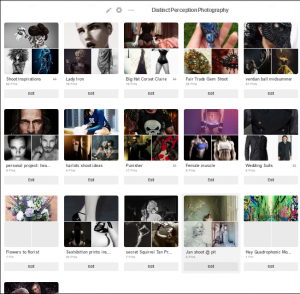 My current image inspiration board is found here and I am constantly adding to it. When people message me saying that like my work and want to work with me, 9 times out of 10 that is where I send them first. All my mood boards are here too and makes it so easy to share and collaborate with the whole creative team. NextNext post:A 5 year plan?